When I bought my current home, one of the 2 biggest issues with the house was the landscaping (or lack thereof). I am working to convert the house into ship-shape so I can rent it out while I am on assignment later this year. Taking out old, weak looking plants/trees/shrubs. 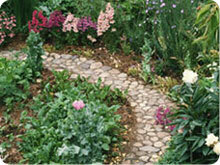 Its costs nothing and can have as big an impact as adding new plants. Buy smaller plants. Time saves money by buying smaller versions of trees and shrubs; they will grow and fill in over time. Some plantings can be split up. I have been able to split some 1 gallon shrubs into 3 plants (instead of 1) to cover 3 times the area. Relocate small trees/bushes to desired areas. My yard is covered with several varieties of young trees and shrubs that have popped up. I have just had to walk around and hunt for them. I have dug up trees such as small hollies and relocate them to desired landscaping areas to fill in the border of the property. I like to overseed our yard about this time of year (own a home in the Midwest). The Kentucky Bluegrass seed that I purchase is about $30 for a medium sized bag. This simple act of overseeding does wonders for a yard and really adds to its health; quite inexpensively also. I see it as an act of (1) preparing the yard to look great all Spring and Summer and (2) preventative maintenance to keep bare spots from showing up unexpectedly. That's my 2-cents for 2million! SEEDS! Glorious seeds. Learn to love seeds. Perennials. You plant them once and they come back year after year. 1 -- Buy perennials. There are some lovely annuals, but the do have to be replaced every year. 2 -- Root. You can often root plants (such as azaleas). Turn one plant into many over time. 3 -- Spreading plants. I'm transplanting forsythia at the moment. Stuff is beautiful in the spring with its bright yellow flowers -- and grows like a weed in sunny spots. 4 -- Bulbs. Some of these (like daffodils) will grow into bigger and bigger clumps that bloom LESS as the clump grows. Break that clump and replant to have more plants AND better blooms. 5 -- Save 'em. You can use them for landscaping later. 6 -- Grass. Avoid when possible. Okay, if grass is your thing, it's your thing, but it's an awfully expensive landscaping choice: lots of water, fertilizers, seeds, weed fighters -- too much money for too little gain! Thanks -- good tips. I forgot about mentioning perennials - they are the only plants I buy.